This is Cheesecake with Saskatoon Berry Sauce with Raspberry Coulis.It is garnished with Gooseberry on whipped cream. This delicious cake is served at the Saskatoon Hilton Garden Inn. Fresh.Simple. Easy to make. A comfort food of memory. A childhood craving, Very Pinoy. These are the reasons why I chose this egg dish for Lasang Pinoy 17. Except for the steamed rice, it doesn't need heat and sophisticated dexterity to prepare. When a fever is raging , this dish never fails to act as abre gana ( appetite stimulant). It is a constant rainy weather friend that brings a bit of cheer to the dinner table. Think typhoon season, brownouts,howling winds, leaking roofs and knee deep water from an overflown river nearby. Itlog nga Sinamo is how we call the egg dish. Literally, it means Mixed Egg. But what it is, is fresh native chicken eggs mixed with hot steaming rice and seasoned well with sea salt or Tultul .The tultul we would pull out from the garapon--a lidded glass container. ( Tultul is a naturaly processed greyish cube of salt that is pressed all over on a plate of rice to give it a mild salty flavor.Sad to say, the art of tultul making is in the fringe of extinction. )The sinamo can go well with tapa,tocino, pinamalhan or dried fish.Spam or carne norte even.A drizzle of garlic or green onions over the can improve the flavours. I think the process and concept of Sinamo nga Itlog is popularly local , more Pinoy if not Asian.It is fast food the precedes the contemporary concept of fastfood. Mix and eat fresh. That is all there is to it. From the chicken coup to the table.A nutritious table fare for a farmer on the go. Everytime I think of Itlog nga Sinamo, I can see the smiling, warm and nurturing image of my late Lola Meren preparing the dish with a grandmotherly cajoling for me to eat the dish.I can imagine her ignoring my childish tantrums to wiggle a spoonful of the sinamo into my mouth. I am or was a spoiled brat, you know. Lolo's and Lola's boy. I have not prepared and eaten Itlog nga Sinamo for ages. Wary of Salmonella infection, the craving for it has somehow diminished.Fear can dilute the gustatory demands of the taste buds. If not for Lasang Pinoy 17, I wouldn't have cooked the dish again. The "Eggs a Deal "sortie made me unearth this dish once again from the dusty bins of my gray dura mater. The theme egged me to do a little snooping about eating raw eggs. Well, I found out that my all-time boxing idol Rocky Balboa,( yes, he's my favorite more than Congressman M. Pacquiao) drank a couple of Hollywood grade raw eggs at dawn before a stamina building road run and didn't die. The eggs fueled him to pummel his foe to a gory submission. 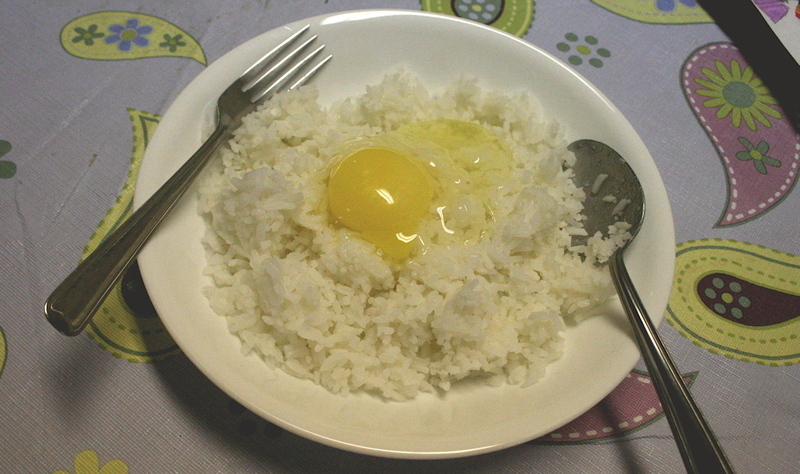 I am more than convinced that nothing will happen to me if I actually relive my happy memories of eating raw chicken eggs on steamed rice. Begone Salmonella! Hey look.Rocky returns and flops at 60. But he is alive. So am I. It's the chicken's gift, I think.If not, it's Lola watching over me. Remember , I am Lola's Boy. 1 native or organic fresh chicken egg. Tultul or salt to taste. Wash the eggs thoroughly in water. 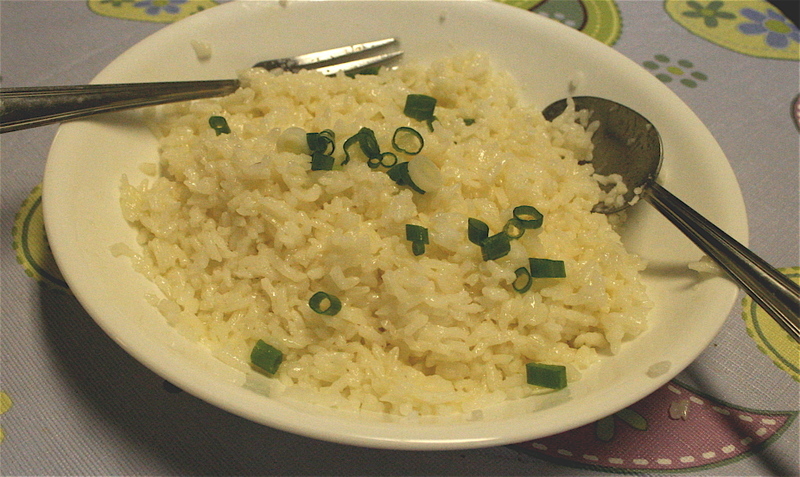 Season with salt and mix the rice and egg well. If using tultul, mix the egg with the rice first and gently press the tultul on the rice. I know. I host shouldn't be late for his own event. I had it all planned for the week. Since work wouldn't let me have my way, I was going to post my Lasang Pinoy entry yesterday, May the 6th(May 7th in Pinas) in the evening. But as fate would have it, a taste of the unforeseen happened. I was skinning and slicing a pineapple when my super sharp Henckels serrated knife lost its way and sliced through the tip of my precious unblemished left middle finger as well. It deeply cut the flesh and took a portion of the fingernail too. Blood spurted out that I had to put pressure on it and run it through cold running water until the bleeding stopped. 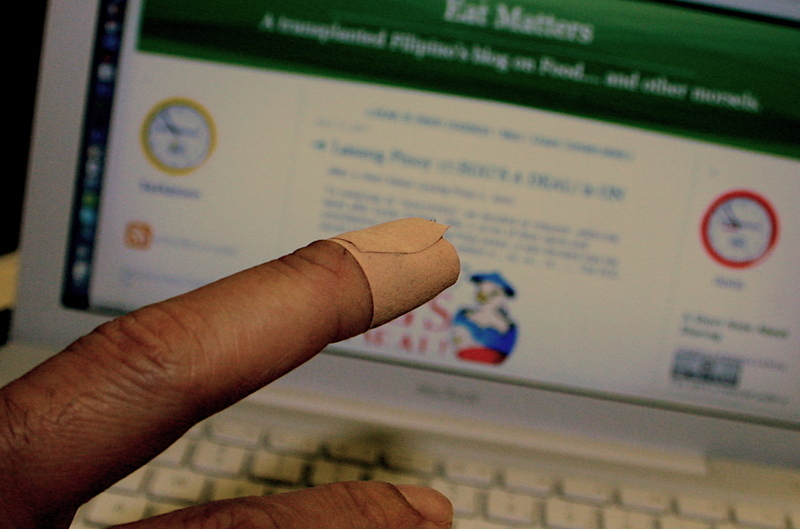 It finally took three heavy duty "band aids" wound tightly to stop the bleeding. By measure, it is just a small wound but the gap was deep and the blade pierced the most sensitive part of the hand-- the fingertip. I tried putting a "finger condom" over that dirty finger but had to take it off later as it was constricting blood flow.Gosh. The pain yesterday was really awful. It is a lot better today. The bleeding has stopped. A single band aid keeps it protected and hopefully it will heal heal fast. I could have the wound in a less functional part of my not-so-sacred body. That small accident has led into another uncomfortable situation. I am one of those rare species on earth who types on the keyboard with four fingers--the middle and the index fingers of both hands. Now, I can type with with only three f_ _ _ _ _ _ _ ones not to mention a super slow God-given WPM typing skill and a Lasang Pinoy 17 Round Up coming up. In an hour, after bringing my little kindergarten girl to school, I am gong to see Mr. Medicine Man to have this finger checked. Tonight I am going to post my entry and start the Lasang Pinoy 17 round-up. Slowly but surely with a dirty finger on the left hand dangling in midair cursing the nightingales I will finish my tasks. So pasensya na mga Mare at pare, for the delay.